August is National Sandwich Month…Let’s Celebrate! A National Sandwich Month exists? How are we just finding this out? It all started in 1952, when the Wheat Flour Institute established August as National Sandwich Month. How and why has this not been declared a national holiday month or something? That year, newspapers across the country filled their pages with recipes for amazing sandwiches. This annual observance continues today. There is no denying America’s love of the sandwich, we eat more than 300 million of them every day! From your basic peanut butter and jelly on white to a heaping cheesy meaty bagel sandwich (our personal fav, of course) the possibilities are endless. You could even say it is THE perfect food. But, did you ever wonder about how it all started? Sure, you’ve heard the tale of the Earl of Sandwich, but did you know the story is even older than that? Here are some cool facts about sandwiches and great suggestions on how you can keep the sandwich party rolling all month! 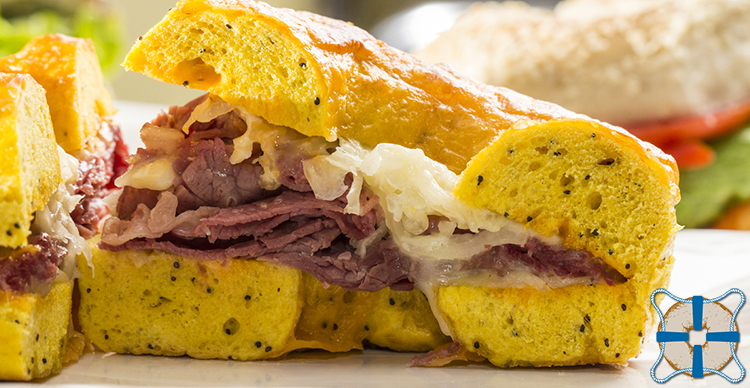 So, legend has it that the sandwich as we know it today was popularized in 1762 in England. That tale states that at that John Montagu, the 4th Earl of Sandwich had a major gambling problem and would spend hours, even days obsessive playing, not leaving the card table. During one particular binge, the Earl ordered the house cook to make him something he could eat whilst still playing. The cook slapped some meat between two pieces of bread and henceforth “the sandwich” was born. However, the basic concept of the sandwich predates the famous Earl, and versions of this tasty meal have been accounted all over the globe. For instance, throughout the Meditteranean people have been wrapping meat in unleavened bread for centuries. And, historical notes show the ancient Jewish sage Hillel the Elder (died 10 CE) wrapped lamb and bitter herbs between two pieces of matzoh during Passover. There are even records of versions of wrap sandwiches found in Asia and Africa. Therefore, it is accurate to state that humans have been consuming and loving sandwiches for thousands of years. PB&J…Love it or leave it: Did you know the average American child eats about 1,500 peanut butter and jelly sandwiches before finishing high school? Out of this world! Astronaut John Young smuggled a corned beef sandwich on board a Gemini flight. What’s in a Name? Submarine sandwiches are called “hoagies” in Philadelphia and “heroes” in New York. Treat the office to bagel sandwiches for lunch. Send your kiddos off to college with a bag full of bagel sandwiches, because…bagels=lifelong friends. Step out of your comfort zone and try a new bagel sandwich. Fuel up with a bag of bagel sandwiches on your next outdoor adventure and enjoy hours of endless energy. Create your own bagel sandwich and post it on social media, because honestly who doesn’t love a good food pic? We are super excited that August is National Sandwich Month! Chalk it up as yet another reason to order and enjoy a yummy Naval Bagels sandwich today.